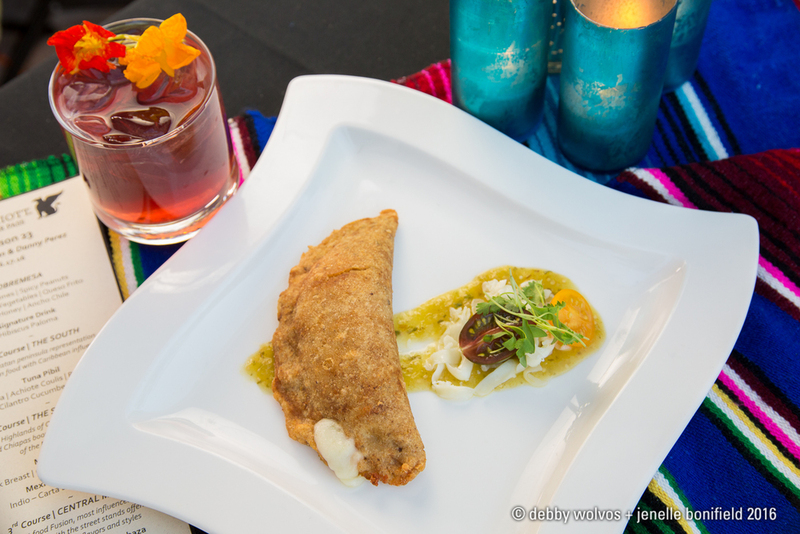 On Saturday, June 18, 2016, Visit Tucson with the Southern Arizona Arts & Cultural Alliance introduced its inaugural Mexican Food Festival, Tucson 23, at the beautiful JW Marriott Tucson Star Pass Resort & Spa. To kick off the weekend of festivities, a special sold-out Chefs Dinner was held on the picturesque patio of the Signature Grill Friday evening. Born in Mexico City, Executive Chef Danny Perez of the JW Marriott Starr Pass (and reigning Iron Chef Tucson) collaborated with Chef Maria Mazon of BOCA Tacos, who integrated her Sonoran roots into their multi-course Mexican menu with beverage pairings for $40 a person. Guests were greeted with colorful and refreshing Hibiscus Palomas, made with tequila, steeped jamaica/hibiscus, fresh lime juice, and grapefruit soda. We began the night joining our friendly tablemates and sharing sobremesas, an appetizing medley of vegetables en escabeche (pickled), crunchy chicharrónes, queso frito with ancho chile and honey, and spicy peanuts. Chefs Perez and Mazon spent time with the guests explaining each of their dishes for the next five courses. "The Yucatán peninsula represents a diverse culture of food of Mayan influences and the Caribbean influence," said Chef Danny as he introduced his first dish, a twist on the traditional cochinita pibil. His delicious and inventive inspiration served pristine seared tuna on a bed of black beans (served cool and creamy) with achiote coulis and a zippy ginger-cilantro cucumber salad. A flight of Mexican beers was paired with the rest of our dishes: Carta Blanca, Indio (available in the US within the last year), and Victoria. Chef Maria's multilayered and complex mole de pato (mole with duck) and arroz rojo (red rice) included memories of her grandmother. "The only way she would eat arroz rojo was with a banana, and now I do too and teach my son the same." Her mole made with 21 ingredients was served with crispy-skinned, tender duck breast, rice cooked with vegetables, and banana slices bruléed and finished with sea salt. "Mole is one of the dishes that define Mexico, with Oaxaca being one of the beautiful cities that Mexico has to offer," she noted. My husband especially loved this course because his mother was from San Luis Potosí, Mexico and a favorite dish growing up was mom's fried bananas with arroz rojo. "I grew up on quesadillas, " said Chef Danny. "Across the street from my abuelo's house was a little stand and between 7 and 7:15 every night, the lady would pull out her comal and just start frying quesadillas." In central Mexico, quesadillas are made with corn masa and Chef Danny's addictive vegetarian version was stuffed with queso Oaxaca and flor de calabaza (squash blossoms) and served with a spicy salsa verde, heirloom tomatoes, and ribbons of Oaxacan cheese. I'm a big fan of machaca and Chef Maria's is the best I've ever had. Dried and shredded, almost fluffy beef was piled high on a blue corn masa gordita with lettuce, crema, cotija, and pickled onions and plated with a side of au jus or caldito. "The way I like it is to just dump the caldito on top and go for it," she suggested, which is exactly what I did. "The machaca is our pride and joy," she said, and it's easy to see why. Our indulgent Mexican dessert course was a duo of creamy arroz con leche with raisins and tamarind, and a tamal de dulce with cajeta, sliced apples, and a spicy ginger-tamarind jelly. A final touch was a snifter of fragrant apple-cinnamon tequila to pair. It was a superb introduction to the Tucson 23 festival, the culinary talents of these two chefs, and my first visit to the JW Marriott Starr Pass. Day two and the main event with photos can be found at this link.